An easily absorbed oil rather than a serum, Vanderohe is an all rounder skincare product, that is so effective, it can replace your day and night moisturisers, eye cream and serum. Packed with Soil Association certified organic grapeseed, rosehip, apricot kernel, rose geranium, cedarwood frankincense, chamomile and neroli oils, rose otto, myrrh and lavender Vanderohe No.1 hydrates, nourishes and calms the skin, making it soft and glowy. It works on all kinds of skin issues, including acne and eczema, and it's particularly effective on damaged and flaky skin. Yes, at £88 it's a little pricey, but SPF aside, you really don't need to use any other product in conjunction with this and it also lasts for ages as you only need to use a couple of drops in the morning and at night. The brand also does a travel size bottle, which lasts about a month and it's priced at £33, so you can try that before investing in the bigger 30ml size. Buy now. Weleda Pomegranate Firming Eye Cream is light and easily absorbed, which makes it ideal to wear under makeup. It has a firming effect and it's gentle enough to be used by those with sensitive eyes. Its highly hydrating properties make it a perfect product to use in winter. Buy now. 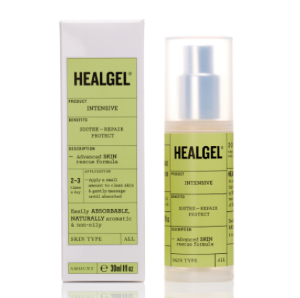 Healgel Intensive works wonders to soothe, repair and protect the skin. It's particularly effective at tackling irritation, inflammation, redness and eczema. It can be used to soothe and replenish dry skin caused by the wind, cold weather, applied as an after sun, used on scars, burns, insects bites, nappy rashes and itchy patches. With algae extracts and arnica, its light gel formula absorbs instantly. Buy now. This hard working serum is ideal for those with dehydrated, dull and ageing skin. It's packed with hyaluronic acid, which acts as a magnet to water, plumping out the skin and hydrating it. It works wonders in winter, when the harsh weather depletes the epidermis of moisture. Its light gel formula is easily absorbed and smoothes the skin immediately, allowing makeup to glide on beautifully and it smells divine. If your skin is particularly dry, use after Sond Slate Cream Cleanser, an excellent, moisturising face wash that melts makeup away whilst nourishing. Buy now. Don't let the lightness of this moisturiser fool you, this is a seriously hydrating day cream and one of the fastest to absorb that I've ever tried, which makes it ideal to use under makeup without having to wait 10 minutes to let it fully sink into the skin. Its light and sweet scent reminds me a of baby products - just lovely. BRYT also does a version for men and an equally excellent night cream. With mongogo oil, vitamin e, green tea, lemon, bergamot and mandarin oils. Buy now.